My day began by shooting this rather remarkable sunrise on the Canadian River early in my drive to the Wichita Mountains. Michael shoots with his Nikon Coolpix AW100 in the Charon’s Garden Wilderness. With a couple of extra days off this week, and spectacle weather, I was aware that my longtime friend Michael recently mentioned that it had been 18 months since he and I got together to make pictures. I called him and asked if he could swing a short-notice day off, and incredibly, he had nothing on his slate. 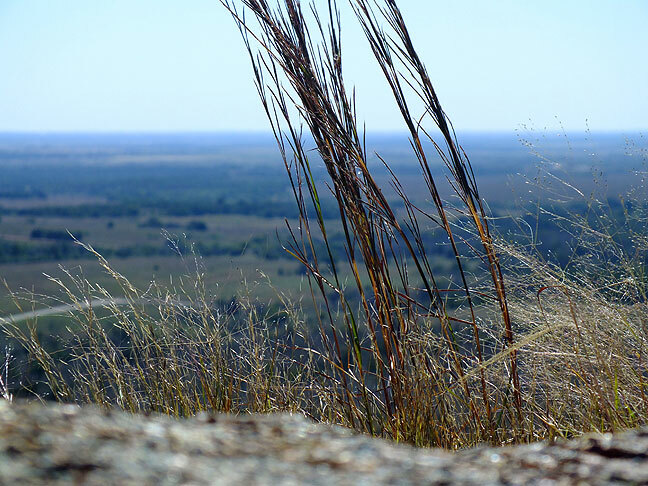 We met at a truck stop near Medicine Park, Oklahoma, and after a quick break for Michael to buy water and a couple of snacks, we drove into one of our oldest haunts, the Wichita Mountains Wildlife Refuge. Michael and I have been hiking there since we were young teenagers. Michael poses for scale at the base of “Lock Rock” in the Charon Gardens Wilderness. Some of the potholes in the granite formations of Charon Gardens were full of water. Amazingly, when Michael and I were young, we drank from puddles like these and didn’t get sick. On our drive to the Charon’s Garden Wilderness Area, the trailhead for which we long-ago incorrectly named “Glacier Rocks,” we saw a very unshy coyote (perhaps rabid? ), and a large number of wild turkeys. The hiking itself was a lot like it’s always bee with Michael: since there are no trails in the Charon’s Garden, we follow our explorative instincts. We hiked and explored for a while, and it definitely made pictures. 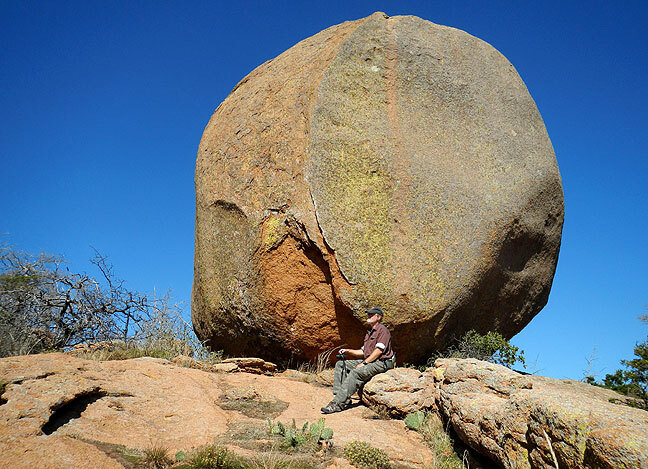 Our rally point was the “Lock Rock,” a huge boulder we have been hiking around and photographing for many years. 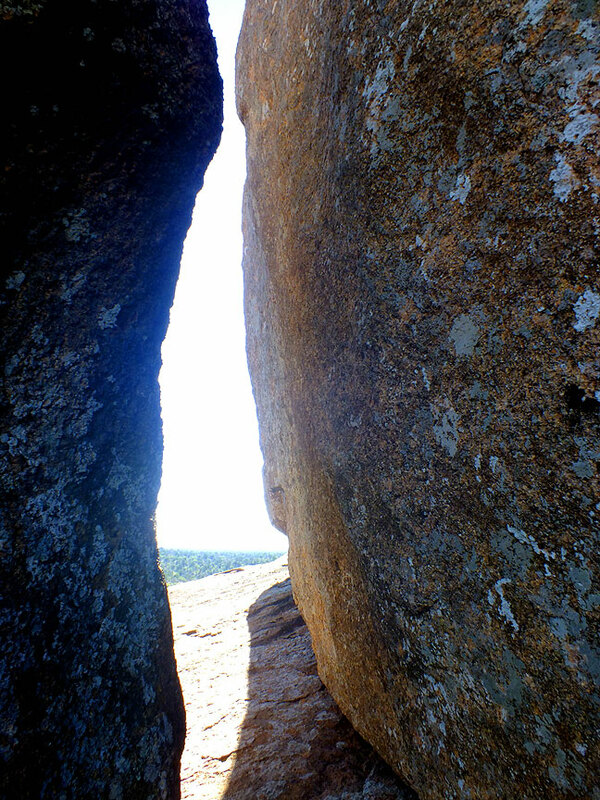 We call it “Lock Rock” because it’s one of those formations that you might be able to climb, but you would not be able to easily unclimb, and would find yourself “locked” on top of it. After seeing trees like this throughout Charon Gardens, we concluded that the area must have been devastated by fire recently. After more than an hour at Charon’s Garden, we took a short break, then drove up the road a piece to the Dog Run Hollow trail, which is actually a network of trails. We hiked the western portion of the network, ending at French Lake. 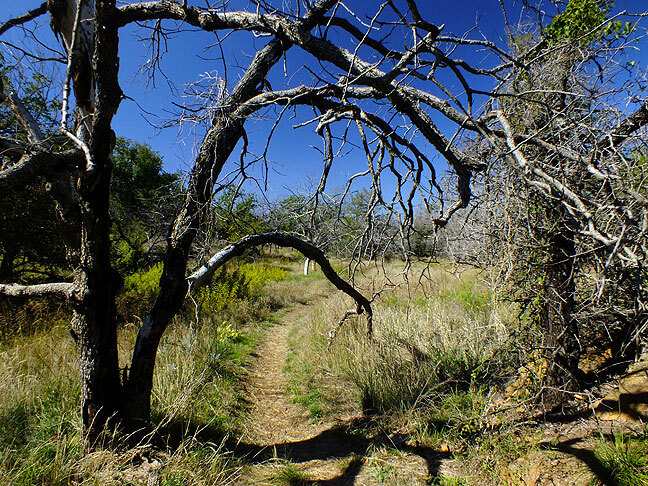 The Dog Run Hollow trail system takes hikers through many of the natural elements of the Wichita Mountains, including this dense wooded area. 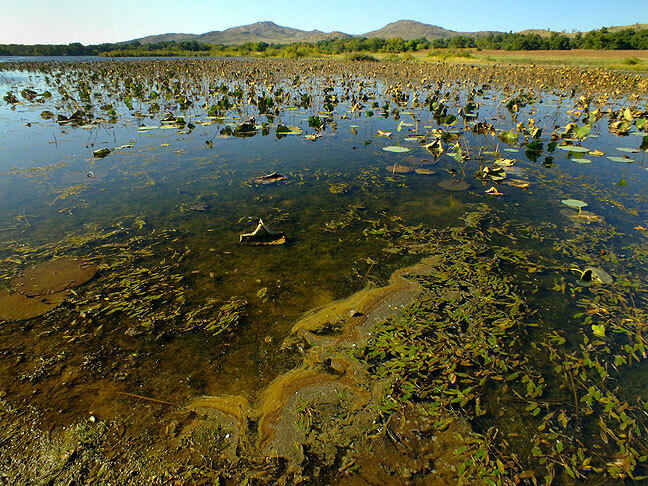 This water lilies at Lake Quanah Parker appeared to be dead or dying, possible because of a summertime algae bloom. After dropping by the visitor center to fill Michael’s water bottle, we made the short drive to Lake Quanah Parker. Passing the top end of the lake, we saw what looked a little like a cypress swamp. We were able to walk out on the playa of the lake for some distance and discovered that it was a cluster of dying water lilies. Michael looks through the window of an abandoned/historic rock house in the refuge. 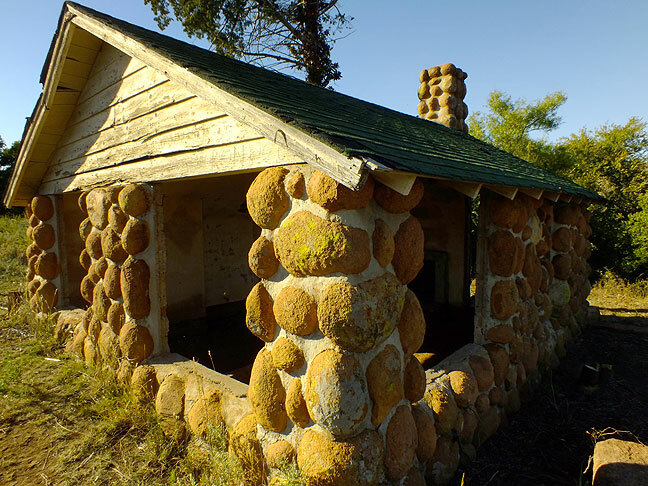 Heading east from Quanah Parker, we came across a rock house I’d seen several times but never photographed. It was an odd combination of a derelict structure and a historical monument. A road led to it, but there were no signs about it. Someone had brush hogged around it, and it was full of graffiti. We spent a few minutes photographing it, which I found fruitful. Dodging a number of wasps, I made this image at an abandoned but possibly historic rock house. 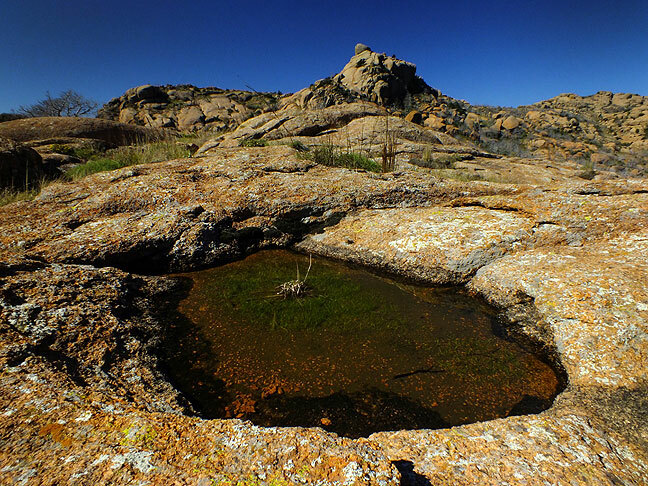 Our final venue was Mount Scott, the high point of the refuge, which is our typical way to end the day in the Wichitas. It’s an easy drive to the top, and we sort of decompress from a day of hiking by finding where we’ve been and decide where we might go next time. We spotted these two young ladies making pictures of themselves and the scenery a short way below the summit of Mount Scott, the high point of the Wichita Mountains. 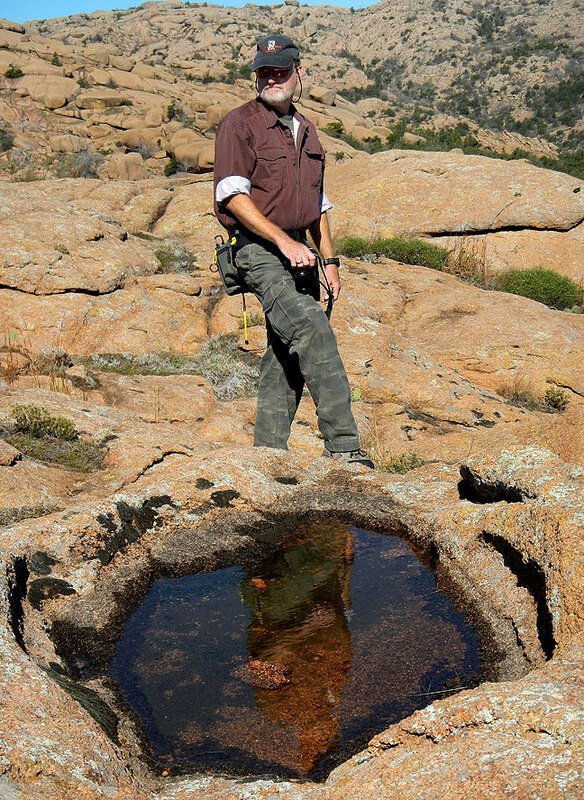 Michael braces himself as he makes pictures near Shelf Rock and The Crack, two feature he and I have been photographing in the Wichita Mountains since we were teenagers. 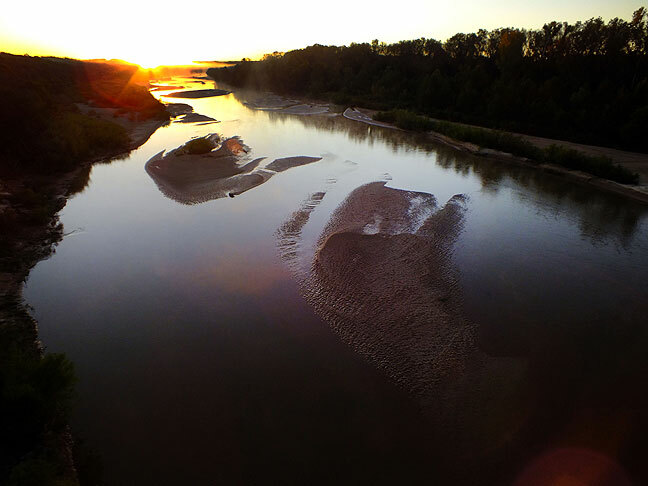 This is a wider view of the Canadian River at first light. The Dog Run Hollow trail network leads into pristine woods. 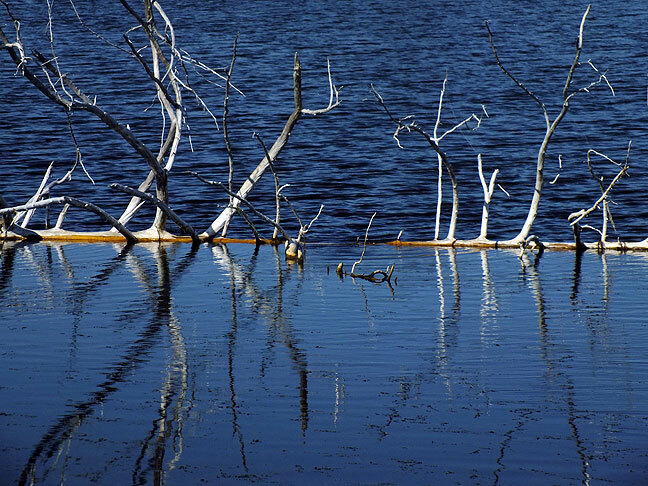 Dead trees create a flow barrier in the waters of French Lake. Wind whips through wheat grass near Sitting Rock. 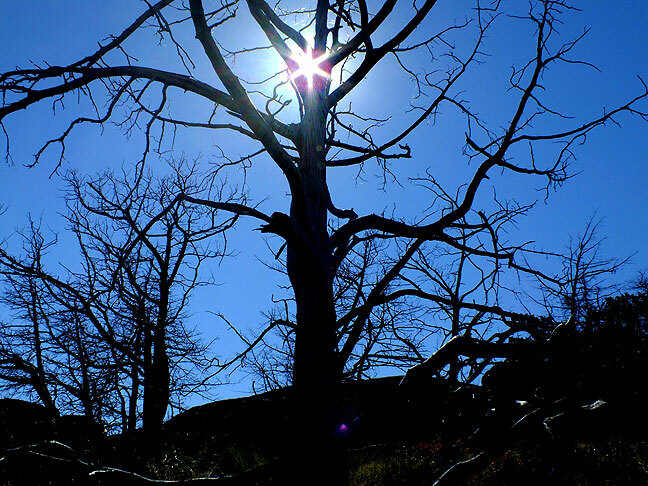 Sunlight streams between branches of dead trees in the Glacier Rocks area. A boulder field forms a natural playground in the Glacier Rocks area. 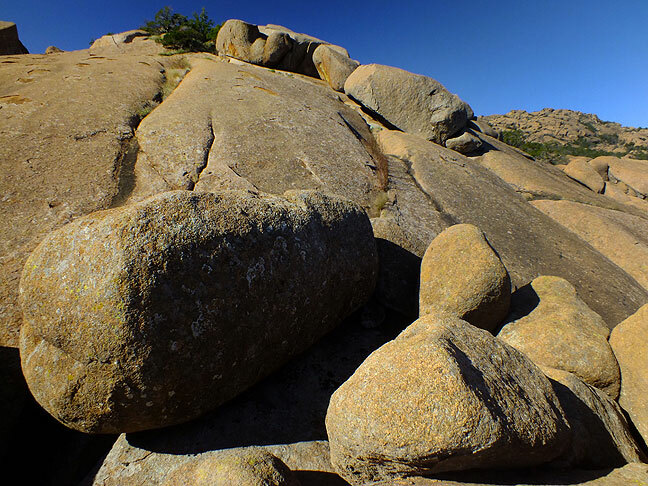 Granite boulders form cracks large enough for an adult to traverse. 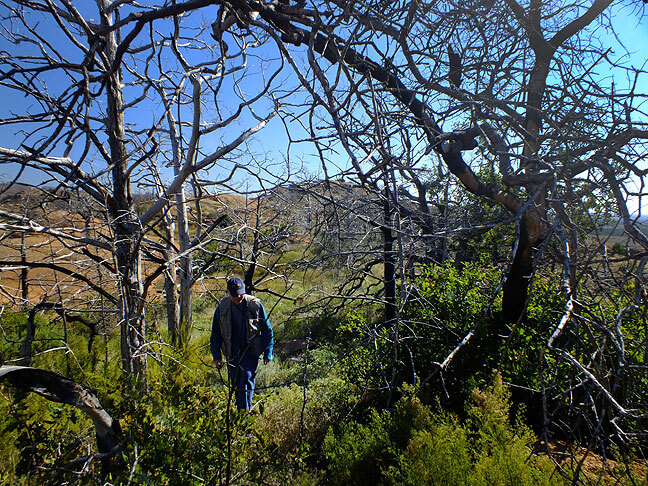 Michael hikes up through an area of dead trees near Lock Rock. 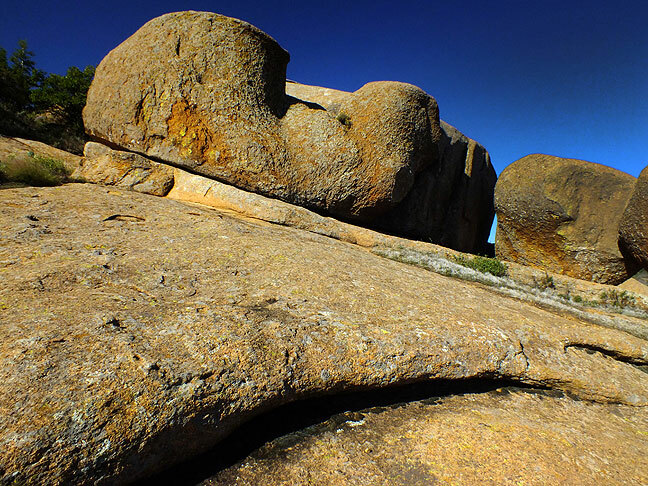 No matter how much I visit, these ancient granite boulders look amazing, and are even more amazing to climb. 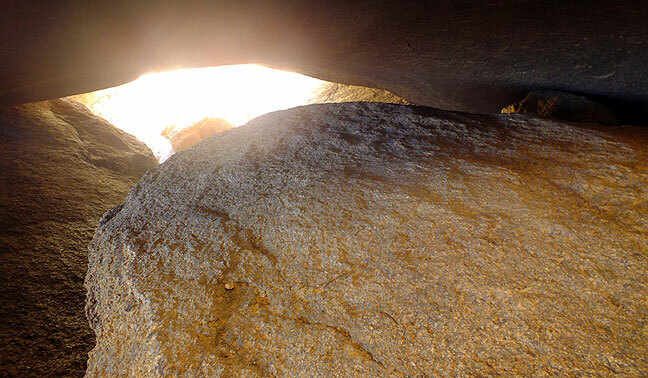 There is certainly no shortage of cave-like rockfalls in the Charon’s Garden Wilderness. This pothole, filled with rainwater, is on a gentle slope en route to Sitting Rock. 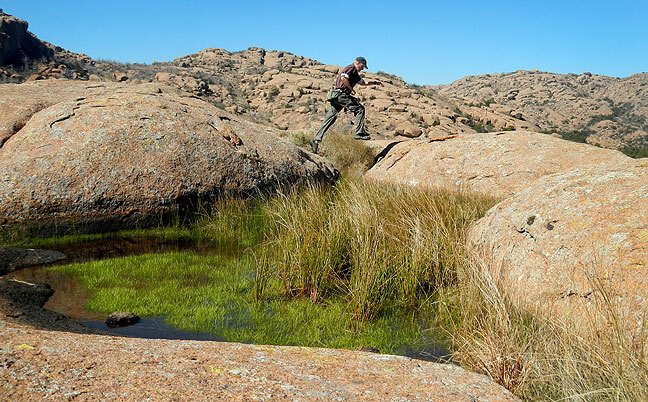 Michael made this image of me leaping across a small chasm. 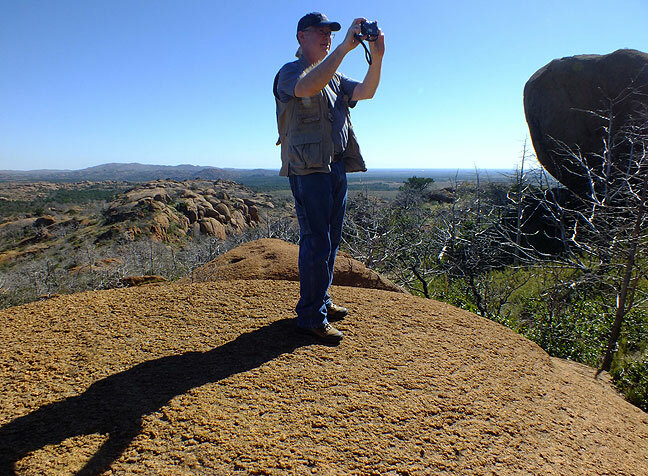 Michael takes aim at Lock Rock from a smooth granite outcropping. 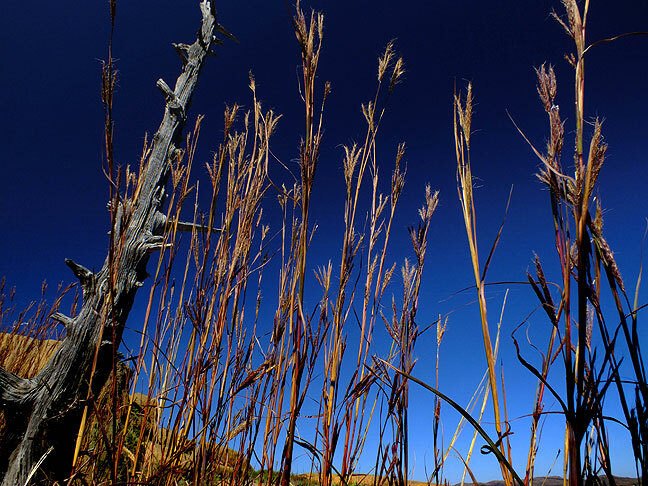 Wheat grass stands against pure blue sky. This playa at Lake Quanah Parker was quite interesting. 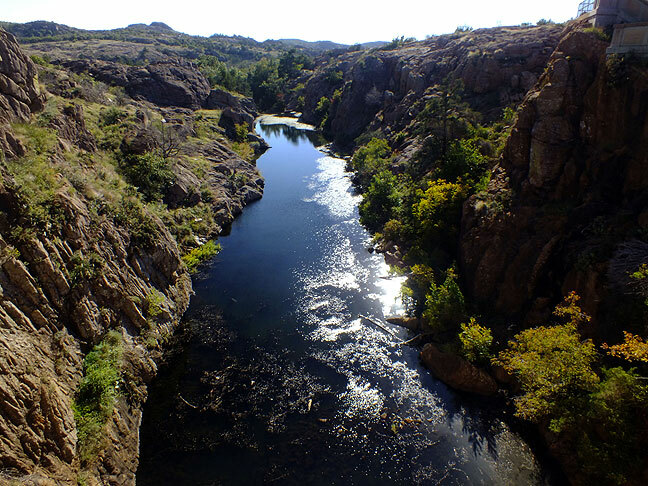 This is Quanah Creek below Quanah Parker Lake Dam. 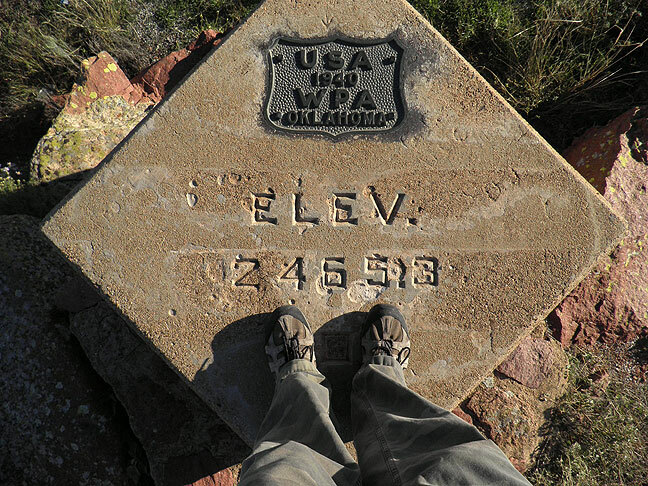 I shot this from the Refuge high point, the elevation marker at Mount Scott. 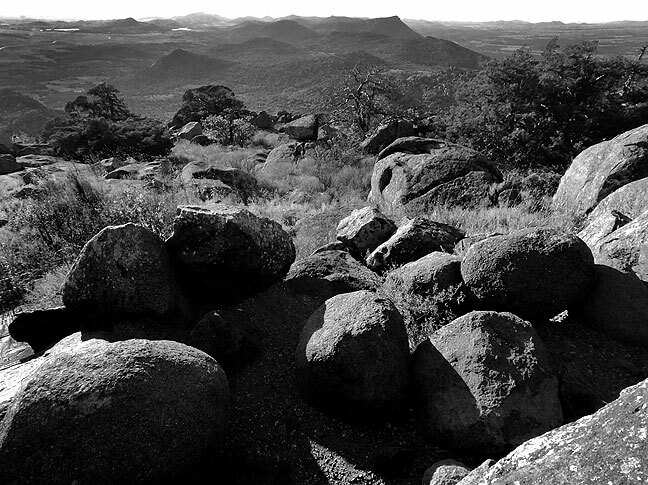 This hazy view from the summit of Mount Scott looks west, and I feel the black-and-white rendition more dutifully expressed the tonal qualities of the afternoon light. 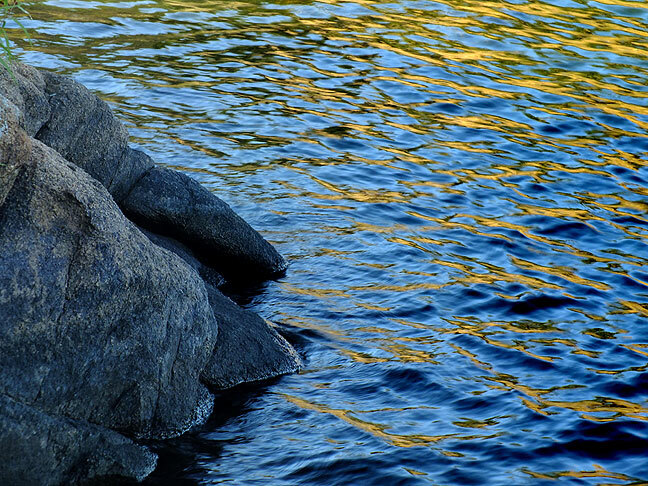 Sky reflects in the water of Lake Quanah Parker. 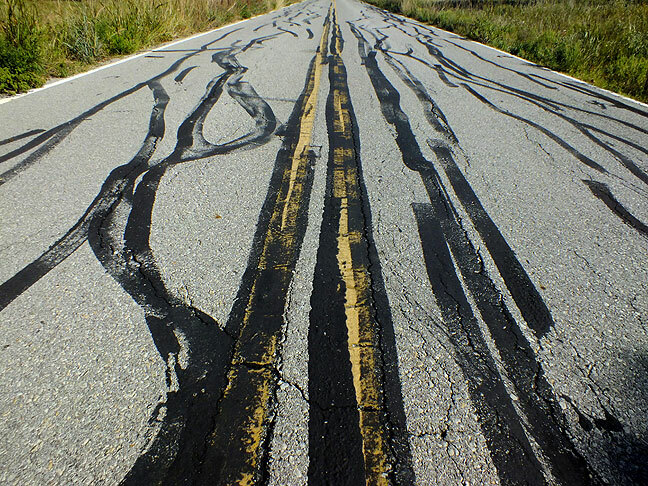 These marks were present on the road to the French Lake trail head. I don’t know what made them. This is a stone we nicknamed “Shelf Rock” decades ago. Your host poses for Michael’s camera in the Charon’s Garden Wilderness. This is the unmarked stone house we stopped to photograph on the main Refuge road. Michael photographed me at Lock Rock. 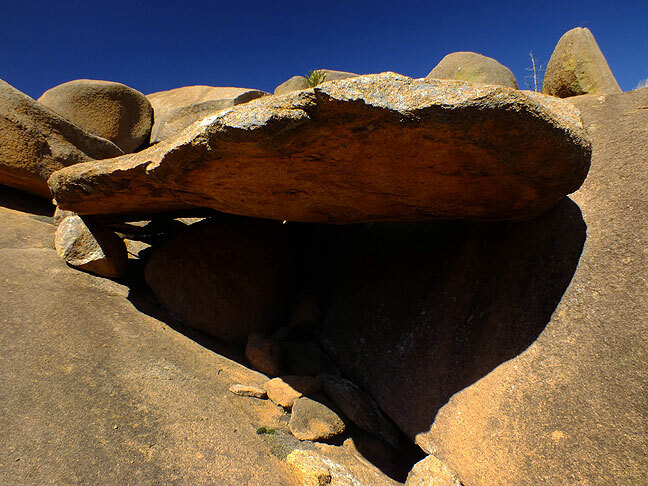 For as unstable as it looks, this huge granite boulder hasn’t moved even and inch in the 40 years since I first visited it.